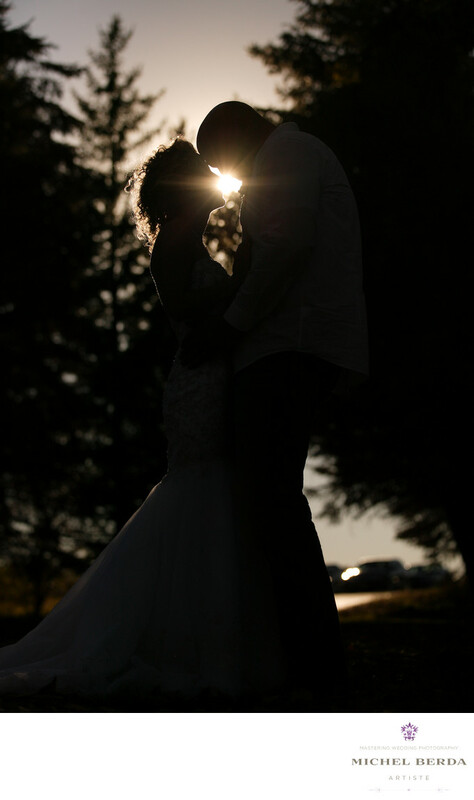 I love this image because it is so important for me to create amazing wedding photography images for every clients. Take this image that I captured for them on a destination wedding, that I was so fortunate to be a part of, at the lovely Lakeside Ranch, in Helena Montana. This place is breathtaking, it sits on the shores of Hauser Lake, 3,200 acre reservoir on The Missouri River, and surrounded by beautiful landscaping, nature trees, and a variety of wildlife, while you would think I would have concentrated my camera on capturing this type of nature at Lakeside Ranch, for my couple, I decided to use my favorite style and art in creating a silhouette look, while dialing down my exposure composition, and then positioning myself perfectly in the middle of the light from God posing the couple correctly, I captured this amazing wedding image. The result is priceless, the moment is still, reminiscent of the couple, that is always my goal for every client. Keywords: bride (66), groom (69), Hauser Lake (3), Helena Montana (3), Lake Side Ranch (3), The Missouri River (3), Wedding Photographer (1254), Wedding Photography (123).